The Ultimaker filament support will allow you to print complex and technical objects with a double extrusion printer which needs printing supports. The filament support is used in double extrusion for 3D printers Ultimaker 3 and Ultimaker 3 Extended. With Ultimaker’s PVA filament support, you will obtain professional quality prints. 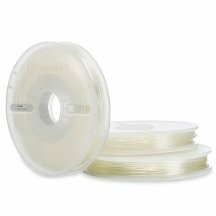 Ultimaker PVA filament is a filament support for your 3D printing in PLA or Nylon. It can be dissolved in water, and leaves no marks on your prints. You simply need to plunge the print created with the filament support in hot water (30°C maximum) to make the Ultimaker PVA disappear.